That's the same problem as the dancer animations i fixed for FE8. 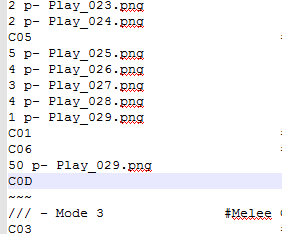 There's missing C0D code at the end of the attack modes(normal attack, critical attack, ranged attack, critical ranged attack and missed attack). that's a cool bit of info, thanks for sharing!! Oh, you solved it? Nice. I thought it was going to be some weird old-version new-version thing once I saw the events, but by the time I scrolled down it seems like it was fixed lol. hopefully it's not an issue again in the future!